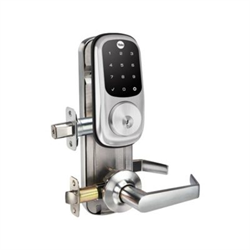 The Yale YRC226-ZW2-619 touchscreen lock gives you the ability to lock and unlock your door remotely. The YRC226 is Zwave plus certified and Grade 2 certified so you know it's built tough. Using the Yale Accentra Cloud-Based software, you can manage access for residents, guests or staff with ease from anywhere using a compatible Windows, Apple or Android device. Distribute up to 25 pins to visitors and grant new ones in the event of a relative forgetting theirs. You’ll never have to worry again about anyone being locked out. When integrated into a Z-Wave or ZigBee system, this capability can be expanded to up to 250 pin codes. Battery powered, it comes with an additional backup battery as well as a low battery indicator to keep you informed. It also comes with the option of using a key in the event of power failure or the need for battery replacement. Installation can be done in minutes with just the use of a screwdriver so you can either do it yourself or have it professionally installed. 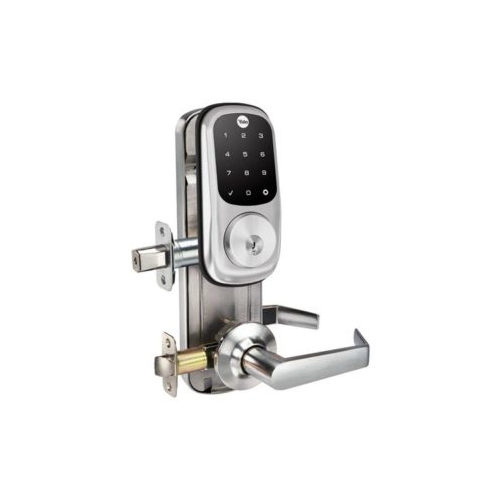 Voice assisted programming helps to run the set up smoothly, instructing you every step of the way to set up your new lock. Once installed, the keypad will wake with a simple touch to display the backlit touchscreen keypad. The unit comes with a rubber gasket to protect your door and shield the lock form weather elements so you don’t have to worry about harsh Canadian winters damaging it. Comes in a satin nickel finish. Lever not included and required to be purchased separately.